48th Institute Lake Superior Geology & GAC/MAC | Geoconferences (WA) Inc.
Firstly I would like to thank Geoconferences for the generous JH Lord Travel GHrant that made it possible for me to attend the 48th Institute on Lake Superior Geology meeting in Kenora, Canada (13-16 May 2002) and the GAC/MAC conference in Saskatoon, Canada (26 May-2 June 2002). I presented a poster at the GAC/MAC conference based on my work that I have carried out during my Honours year (2000), as well as work done in my first year of my PhD (May 2001-May 2002). My project focuses on the study of xenotime, a rare and minute diagenetic mineral that can form in siliciclastic sedimentary rocks shortly after sediment deposition. The usefulness of this mineral in dating sedimentary rocks has only recently been discovered and, thus, not a lot is known about xenotime. My studies are of Proterozoic sedimentary basins. I am studying two, possibly three such basins in order to learn about the formation of xenotime and its characteristics, as well as determining the most ideal rock type in which to locate this rare and minute mineral, thus saving sampling time. I am looking at the Mount Barren Group, in the southwest of our state; the Marquette Range Supergroup, Animikie Basin, in the Lake Superior Region, USA; and possibly the Karelians in SE Finland. This will also enable me to do some comparison work between the three basins. A summary of the work that was presented on the poster is given below. The importance of fossils to understanding Phanerozoic basin development and structure cannot be overstated. Authigenic xenotime is poised to become the “fossil” of the Precambrian, via in situ U-Pb geochronology using SHRIMP (Sensitive High Resolution Ion Microprobe). Xenotime overgrowths on detrital zircon grains are common in siliciclastic sedimentary rocks, and begin to form during initial burial of sediments. In most cases, xenotime overgrowths are generally less than a few microns in size, and only rarely exceed 10 microns, the minimum size required for in situ SHRIMP analysis. From the greenschist facies Mount Barren Group in southwestern Australia, xenotime occurs in well sorted, mature phosphatic sandstone as a coarse (to 200 microns), pore-filling cement that nucleated on detrital zircon grains. Analysis of xenotime cement by SHRIMP U-Pb geochronology yields two main age populations, 1696 ± 7 Ma, interpreted as the age of early diagenesis, and 1646 ± 8 Ma, regarded as a burial-related fluid migration event which predates oil migration and infill quartz and carbonate cements. Previous geochronological studies show that the Mount Barren Group must be younger than 1790 Ma, the age of the youngest detrital zircon population, and older than 1200 Ma, the age of peak metamorphism. The xenotime U-Pb data indicate that the succession formed at ca 1700 Ma. WDS microprobe analysis of xenotime cements shows REE trends of gradual LREE depletion and MREE enrichment with time, regardless of the age of the growth zones. Our results also show that diagenetic xenotime can retain its authigenic age despite undergoing deformation and metamorphism to mid-amphibolite facies (ie >600°C). Many Precambrian successions have undergone metamorphism of similar or lower grade, demonstrating the potential value of diagenetic xenotime petrography and geochronology to much of the Precambrian sedimentary rock record. Preliminary age data from xenotime in rocks from the Animikie Basin, USA, gives an age of ~1770 Ma which may reflect an epigenetic thermal event in the Lake Superior Region relating to the possible orogenic collapse of the Penokean Orogen (formed ~1890-1830 Ma). Attending the 48th ILSG meeting allowed me to listen and talk to geologists who had worked or are working the Lake Superior Region, thus having a wealth of knowledge of an area I am studying for my PhD. I managed to get some rocks, as well as maps, from a certain area within this Region from one geologist who is currently working there. I was also able to meet up with another attendee, William Cannon, from the United States Geological Survey, who has had a long history in the Region, and kindly took me around the Region so that I could do some fieldwork and sample rocks for my project. 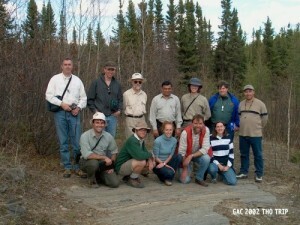 This fieldwork was slotted in between the two conferences in Canada. The GAC/MAC conference allowed me to introduce my work to fellow geologists, as well as meeting those who had heard about xenotime dating and wanted to know more. There were also a few people who were trying the dating method as well and it was good to “share notes” as well as swap business cards. I have been contacted already by one geologist in the USA who has offered to send me some samples from a group of rocks in Canada that have been correlated with the Marquette Range Supergroup. I also met one geologist who is not studying xenotime but is working in one of the areas in the Lake Superior Region that I am studying and he gave me his card, offering his help in any way. I wish to thank Geoconferences again for assisting me in this invaluable experience. I hope that I can now put what I learnt from the conferences, to good use in my PhD studies.